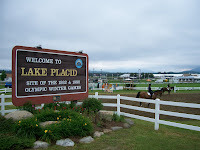 Although I drive or bike past the Lake Placid Horse Shows Grounds on a daily basis, sometimes multiple times a day, I always appreciate the scene. Opening day was a little cloudy, but still the vista was stunning. The low, gray clouds tucked around the mountains created a beautiful backdrop for the equestrian competitors and their steeds. Yesterday was another gorgeous day at the Horse Show grounds.